This 17th or 18th century icehouse is built of brick with a domed roof. It has an arched entrance and a very deep pit. It is located on the Aylmerton-Felbrigg parish boundary and was restored in the 1980s. Located by National Trust. Location seems to be exactly on parish boundary. Brick entrance, arched, part restored. Steps down to chamber inner door, followed by line of tunnel now exposed to air. Domed circular pit, very deep, almost an ice well. Liable to further erosion of covering soil. E. M. James (KLM), 18 May 1980. Date pre 1860 according to National Trust. Restoration by National Trust involved removing corrugated iron, wire, oil and carriage lamps, bottles, three old baths, a bedwarmer, gin traps and bullets. Entrance set in façade wall originally about 2.4m (8ft) high, with quatrefoil blank opening for decoration to one side (other side missing). Steps lead direct to chamber - no flat tunnel. Unbelievably long distance uphill from lake - almost 1.2km (3/4 mile). National Trust now suggest late 17th century date - more probably 18th. E. Rose (NAU) 17 November 1983. <S1> Archive: Kings Lynn Museum Staff. 1974 - ?. Norfolk Archaeological Index Primary Record Card – King’s Lynn Museum. <S2> Publication: Yarham, E.R.. 1981. Frozen Foods. <S3> Newspaper Article: Eastern Daily Press. 1979. 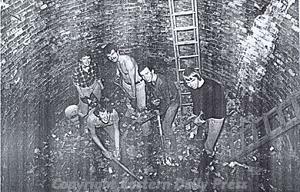 Trust Volunteers Clear Out Old Ice-House. 3 July. 2.